Our Belief that the Russians are coming created sleepless nights. I was only two-years-old when the Soviet Union exploded its first atomic bomb in 1949. My parents had seen pictures of the devastation these weapons caused in the Japanese cities of Hiroshima and Nagasaki. They talked about the Russians and the atomic bombs at the dinner table most evenings. My father was convinced he needed to dig a bomb shelter in the back yard. By the time I was five, I was used to the arguments at the dinner table. Father wanted to chop down Mom’s beloved willow tree to install his bomb shelter. How could she question the legitimacy of his concern? Mom didn’t fight in World War II and the Korean Conflict as he had. He was the expert here, and how dare she question his logic? By the time I entered Kindergarten in 1952, the government had already set up the Federal Civil Defense Administration. One of their guidelines enabled them to conduct air raid drills in our schools. The teacher screamed her command. We were expected to kneel under our little desks and cover our heads and necks with our hands. I hated those drills. The last thing this little girl wanted to do was crawl around on the dirty floor in my pretty new taffeta dress. They even made us watch the movie, “Duck & Cover,” featuring Bert the Turtle. But, every single night, she had me repeat the prayer she taught me: “Now I lay me down to sleep. I pray the Lord my soul to keep. If I should die before I wake, I pray the Lord my soul to take.” Yup, the Russians were coming. I knew she was trying to comfort me, but I stared up after she left the room, picturing a huge white flash on the ceiling of my room. 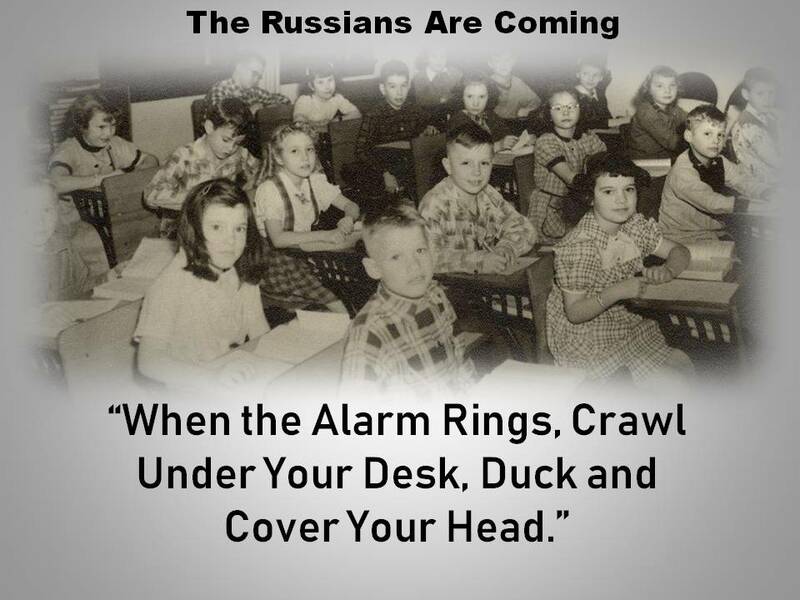 The teachers didn’t explain why we no longer practiced Duck and Cover, but as we headed toward the middle-school grades, we knew all about fallout. By the time Francis Gary Powers’ U2 spy plane was shot down by a Soviet surface to air missile in 1960, my nightmares had lessened, but I still believed the Russians are coming to America and nothing President Eisenhower had to say made me think differently. Every man in our family was deeply concerned over the Bay of Pigs Invasion and the threats coming directly from the Soviet Union. I’ll admit, I laughed at some of the scenes in the movie, but from the time I could understand words, my father conditioned me to fear the Russians. Americans needed some comic relief from the widespread fear of the capabilities of the Russians, and this movie helped to alleviate some of the tension. We had NATO, and the Russians had the Warsaw Pact. We were still in a stand-off. The 60s were a time of unrest and fear. I grew up, got married, and had children. My concern over Russian influence settled in the back of my mind. Oh, I hadn’t forgotten the fears planted so deeply in my psyche. I trusted the leaders of this country to remain vigilant against any potential threats to our safety and democracy. I wrote a simple post on this blog after Donald Trump won the election for the Office of the Presidency. Perhaps I was trying to convince myself that a business owner I’d studied intensely for my training sessions with the banks could handle the office he would soon be taking. You see, I was in the field of commercial credit. I used many examples of bank loans which failed in my training. My ultimate goal was to point out the red flags that existed before the failed investments, so bankers would recognize a questionable deal when they saw one. I also felt guilty for punishing my son harshly for making fun of a sitting President. What I wasn’t expecting that day was the sudden Russian interest in my website. There were more signups than I’d ever had in one week. Research confirmed every new “follower” was using a Russian email account. The nice thing about websites is the administrator’s ability to control what happens. I diligently copied every contact email, printed them out, and forwarded them to the Minneapolis offices of the FBI. Then I removed every one of them. I’m not interested in what the Mueller Report has to say about the man. Nope, I want to hear what the report uncovered about the Russians. You see, I’m not sleeping well again. I want to know the depth and scope of the Russian’s influence on this country and our government. Our warning that “The Russians Are Coming” is no longer accurate. They’re already here. They’ve been here for far longer than anyone admitted to us. If they weren’t, they couldn’t have done everything they accomplished during the last Presidential election. We’re not going to be destroyed by an atomic bomb. Our risk lies in the intelligence capabilities of a very capable adversary.